It's been savagely cold in much of the country lately, and there's little more comforting in frosty temps than a hot bowl of chili. 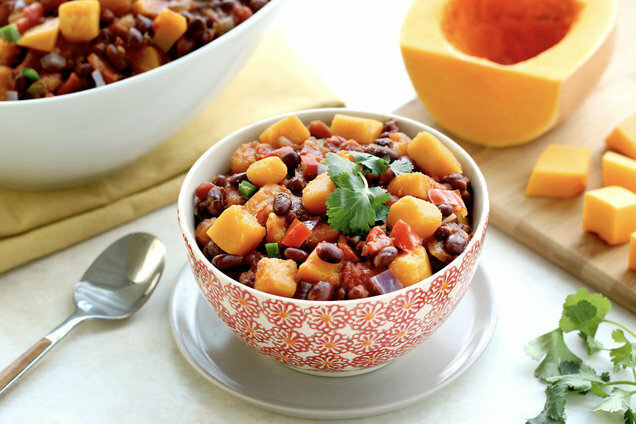 Start up your slow cooker, because we've got a brand-new vegetarian chili comin’ at ya! Pour both types of tomatoes into a slow cooker. Add garlic and seasonings. Mix well. Add remaining ingredients, and gently stir. HG Tips: Look for pre-cut butternut squash in the produce aisle, or click here for squash-cutting tips. And when handling jalapeños, don't touch your eyes (that pepper juice can sting), and wash your hands well immediately afterward. Hungry for More Healthy Chili Recipes? HOORAY for National Pie Day, January 23rd! (That's today, by the way.) Enjoy the taste of apple pie without the fuss of a crust with these Apple Pie Egg Rolls! Everyone needs a go-to chili recipe! Click "Send to a Friend" to share this one now.